Pest Control at ReinventTheFarm. At first sign of the small black Flea Beatles that eat the cabbage leaves, The plant is dusted with our hot chili pepper powder and cut branches of Wormwood are placed on the ground under the leaves. The bugs promptly depart and do not return. 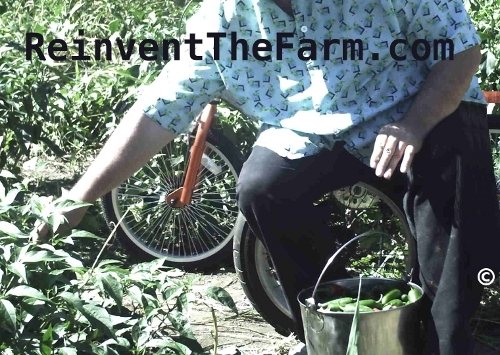 We grow a very hot chili every year that is used strictly for pest control on our gardens and orchards. We even use the stems of the Jalapeños picked fruit that we eat to make a spray and the softer dried meat of peppers grown for seed are powdered for this weaponized purpose. The Wormwood (Artemisia absinthium) leaves are crushed and scattered for indoor and no wind applications. Branches of the plant are cut and placed on the ground for outdoor applications as in this picture. 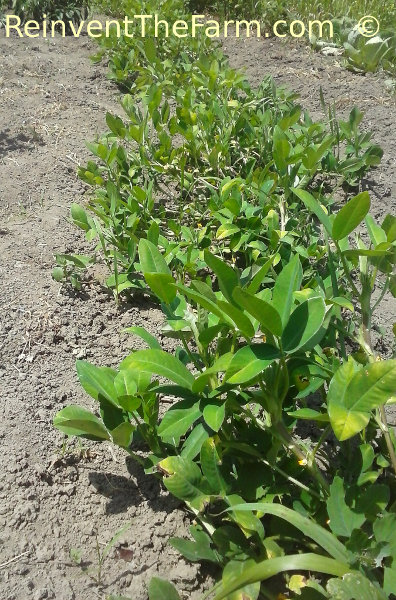 We also use this plant simply with strategic location plantings. 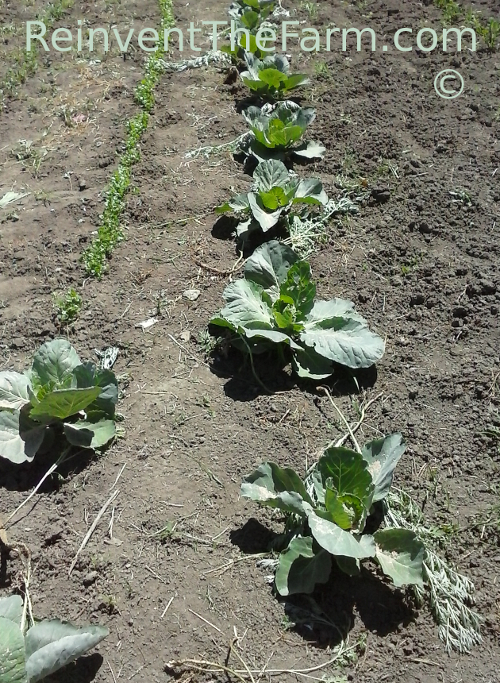 In this picture, the end of one cabbage row is taken by the second planting of Cilantro which is timed to come in with the rest of the Salsa ingredients. Closer look - When the fruit of Rubus occidentalis silvis first forms like a Cap on the end of each stem, it is Light Green then turning white. As the fruit grows it slowly goes through a spectrum of colors turning a Yellow then through Beige to Pink; then from Bright Red to Deep Red to Purple. Eventually it turns Blue and then Darker Blue. Time to eat when it is Dark Dark Blue (Black). Yum! 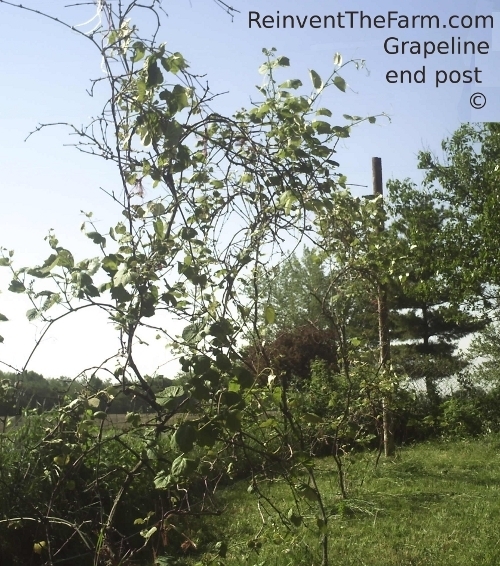 This photo effort began as a feature of Hollyhocks, but the light wasn't right and prominent in the picture became the bramble that is actually an area of cultivated Woodland Black Caps. It ain't a row crop but this could quite possibly be the way that the Adena people would have cultivated this fruit. 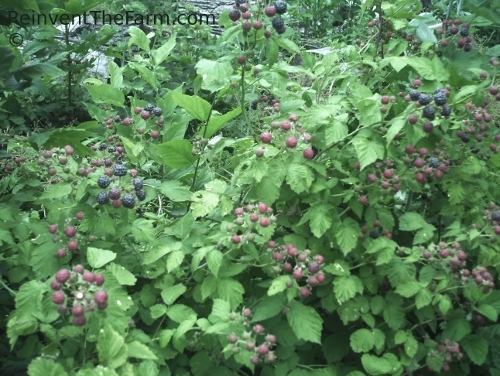 The juice and jams made from these is more valuable than gold, and this large patch of Woodland Black Caps may be the most valuable ground on the farm! Late start This picture was taken in the rain from under an umbrella. 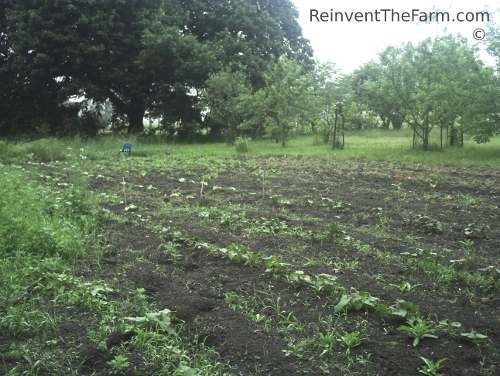 In the foreground are Vardeman Sweet Potatoes (and weeds). Along the left side of picture is Cilantro that was allowed to reseed from last year. Under the large maple tree in background is the evidence of a temporary resting spot (my blue chair). 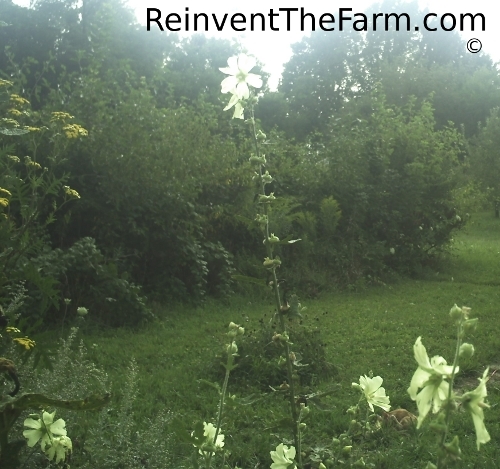 Also in the background are a few young heirloom apple trees. Half of what should already be out is still in the greenhouse; it was too cold and still too wet. Some of the gardens are not yet even plowed, (but it's a start). Closer look - Many of the different varieties that we have tried on some of the Grapelines havn't done well over the coldest of our winters; but the Concords are still going strong! 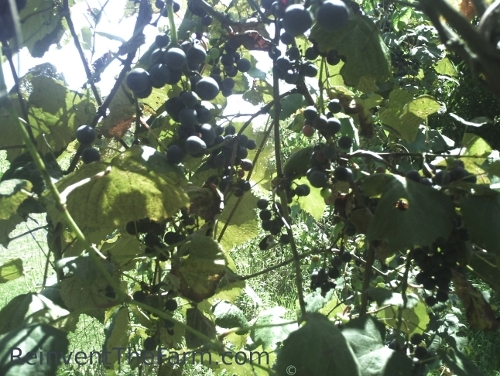 These are not Grape Arbors and there is no dedicated Vineyard here. I call them Grapelines. The plan was developed after reading some university publications and listening to recommendations from a neighboring winery operator, but became considerably altered when I adapted to specific locations and for using materials that I already had on hand. This six inch steel end post is set in concrete 5 feet deep and is 300 feet from similar post at other end of wire. Top wires are 12 feet off of the ground and made of one continuous 600' piece wrapped around each post and both ends into the same hole on a ratchet fence tightener. The third high wire is 6 inches below and goes from post center to center. The bottom wire is 2.5 feet off ground. The plan is to add a steel post just packed in with gravel between each plant and loosely connected to the wire. This Grapeline has 40 plants. Holstein cow at 5 feet. 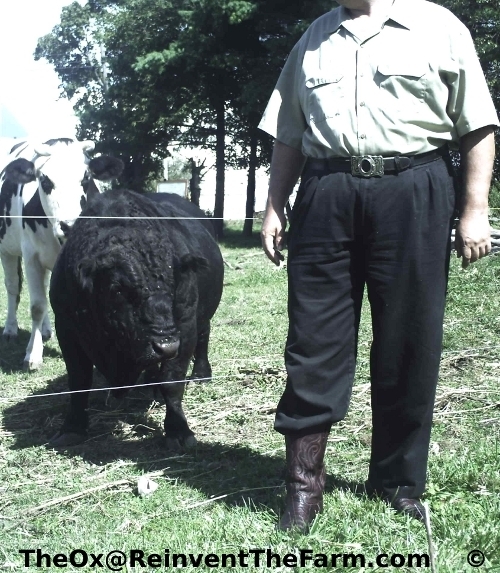 Four short legs on Low-line Angus bull, 38 inch tall adult. Two legs, over 6 feet, adult, that is me. A while back when I was eight years old, I asked my Great-Grandfather why he wore his pant legs inside his boots. He said this is how cowboys wear boots. But he went on to say that to qualify as a cowboy, you had to have at least 3 head of cattle. If you only have 2, only one gets put in. We may not have the answer, but at least we have a plan. 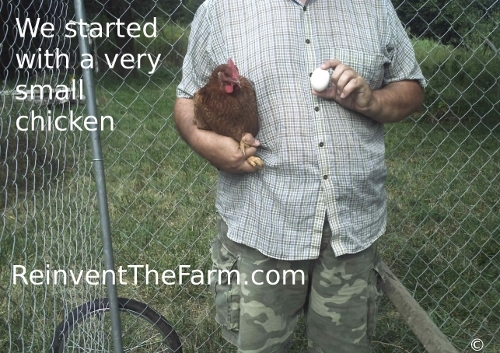 We started with a baby chick and got the Chicken and the Egg at the same time. With feeder at one end, ready to move the Port PAL Chicken Coop. They will stay at the feeder while I push the cage half way over onto taller grass. "Free range" was a nice thought, but the varmints got more than I did. Now I have to push them around a little each day, but the eggs are all mine. The solar panels on the roof power some of the equipment around here, but also the chickens don't get the hot sun or heavy rains beating down, and the panel roof acts as barrier between my birds, and the wild birds that pass through here. 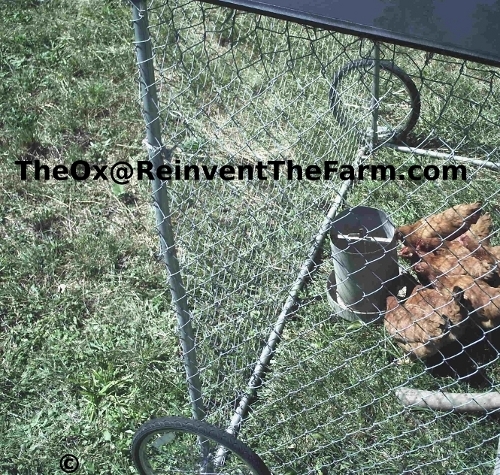 The chickens get to eat the grass grown from ground that has been chemical free for generations, but there is still some debate about whether I can call my bugs "organic". Which brings me to another recommended use: Although the eggs and solar generated electricity compensate for the daily effort, I used this coop to successfully eradicate the farm of termites over ten years ago; without the use of any poisons. (I essentially crawled on my hands and knees around the perimeters of barns and house with a spoon. Found two nests, both were in the ground 10 to 15 feet from the building. Parked the coop on the nest and didn't move it for a while. Voila! better than Clordane.) I highly recommend the Port PAL Chicken Coop for your termite treatment. 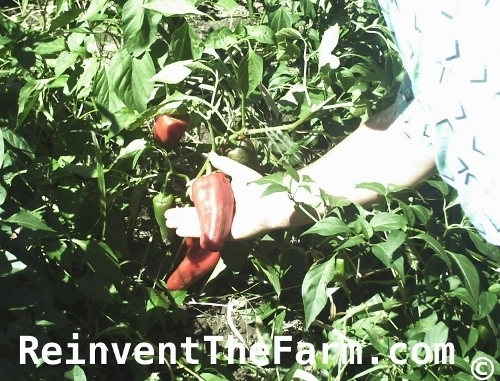 Pleasing pastime: Picking peppers on the Personal Picker. Provides perfect posture & placement for proficient picking productivity. Some Jalapeños are frozen whole. It is easy to separate out the number of peppers that you want for one meal, and put the bag with remaining back in freezer. I usually grill the Jalapeños outdoors. Place over hot fire and turn until the skins turn black and starts to fall off. Then slit each pepper and cook over fire until the moisture from within the pepper largely stops flowing and sizzling. Perfect side dish with any meal. Some of the older and larger peppers get cut up for seed saving. 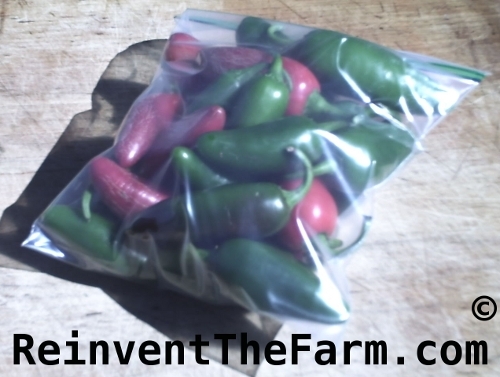 After the seeds have been removed, the flesh from these peppers is bagged and frozen, cut up in 1/2" to one inch chunks. This is perfect to dump straight in the stock pot for your Chili con carne or Hot chili beans or sprinkle on pizza. Also, an excellent way to prepare these is stir frying. Again, this must be done outdoors. Do not fry Jalapeños in a winter time sealed up house, unless you have a very powerful exhaust hood over your stove. I have a breeze-way porch on which I have installed a heavy duty, high heat burner stove that I use for fall canning, and year round hot pepper cooking. Apply a generous coating of olive oil to the frying pan. 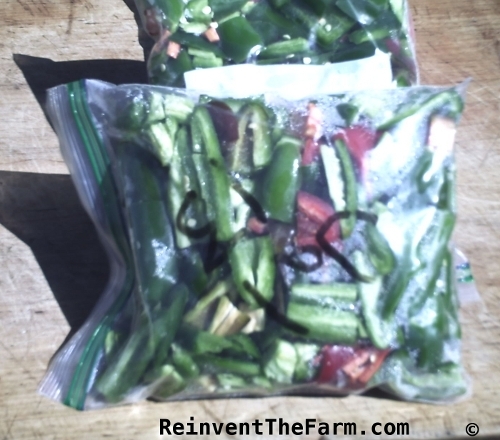 Dump in peppers right out of freezer bag. Stir over high heat while thawing. I usually cook these peppers with onion. After the peppers are thawed and cooking, add large cuts of onion and stir periodically. When al dente with some slight browning, remove, and serve straight up as side dish, or as ingredient to an omelette or topping for nachos. These pepper cuts are too small to put directly on the grill, but the cast iron skillet fits on the grill beside the meat for fajitas. I was once in a place where breakfast everyday was grilled fajitas and beer. I couldn't keep up with beer for breakfast and had to go back to coffee, but I still like my peppers for breakfast and anytime. 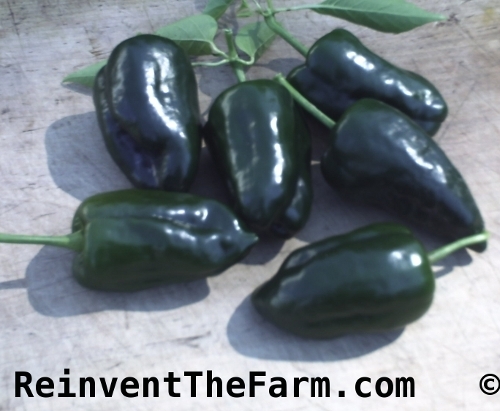 The Poblano is the favorite around here for the Chili Relleno dish. Cut out the stem end and remove seeds and center membrane. Stuff with onion and Cheddar & Monterey Jack cheese, with a touch of garlic, cumin, and add precooked ground beef if you like. Roll the stuffed pepper in a thin biscuit dough and fry in olive oil deep enough to reach 1/4 way up pepper. Cook one side, then turn once and when second side is almost done add more grated cheese on top. 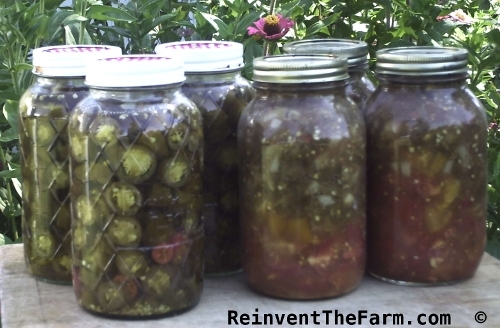 Many of the smaller Jalapeños get canned. Sliced, and with at least one clove of garlic per quart, in a mixture of distilled water, vinegar, salt, and lots and lots of honey. I eat them like candy. When peppers have been eaten, use the honey pickling juice for the best barbecue basting sauce ever. The stock of peppers to eat in freezer and cans is more than a two year supply, but I never fail to make sure that I get some seeds too. Most people eat salt in their salsa. Some say it is necessary for preserving canned food. At my house, guest know that they must select their salt mine, opt iodine in or out, and apply their own. I have never been able to refrain from eating my own salsa for more than three years, so I am not expert at long term storage requirements. But I know from experience that the recipe below is good for 3 years without salt. The garlic may be key, and acid level is high for this cold pack can, but it is excellent eating 3rd year, same as first. I use all of the cloves of a large size garlic bulb per 7 quart batch of salsa. The hard neck White German of about 3 inch diameter. Carefully peel and smash each clove then finely chop and add to the tomato puree. I always use heirloom Cherokee Purple tomatoes. I take the firm meaty ones and dice them to 1/4"to3/8" square and put straight in the quart jar. This salsa is not even stirred until it is served, and tomatoes keep their structure as you take a bite. I take the softer ones and puree them in the hybrid human/solar-electric blender. Boil this down to thicken, but not too much because this is the only liquid solution that we use to expel the air from the can. Stir in the chopped garlic at last minute before pouring into can. The diced tomatoes are put in the can first. Fill can to 1/3 full. The liquid puree will be the last ingredient added before the can is sealed. I use the Rich Sweet Yellow Exhibition Onion. These are very sweet and when finely diced are placed directly in the can to fill another 1/3 way (jar is now 2/3 full with tomatoes and onion). When you use the leaves of this herb it is called Cilantro. When you use the seed, it is called Coriander. When you buy the seed, it could be listed either way. Fresh Cilantro has a very strong flavor, so it doesn't take much of this. I really like the flavor, so I use at least 2 table spoons of the freshly chopped leaf tops per quart. Take care to use only the tips of the leaves, and remove any stems. Going to this much trouble to get a good salsa, you don't want to spoil the enjoyment with these stems between your teeth. I always use only the slightly mild to hot Jalapeños in my salsa. It can only be called 'gall' to call some of the new really mild peppers 'a Jalapeño'. And some of the other varieties of extra hot peppers just have the wrong taste for me. Getting a good Jalapeño is key for this salsa. 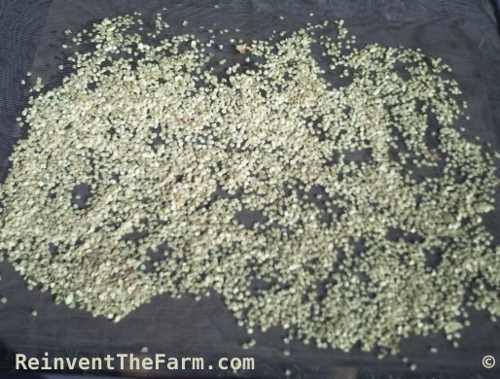 Picked green and tender, all of the pepper is used except stem cap. Dice these very finely. Top up last 1/3 of jar with these minus one inch head space. The Cilantro was used straight from plant cutting. The garlic and onions were peeled. 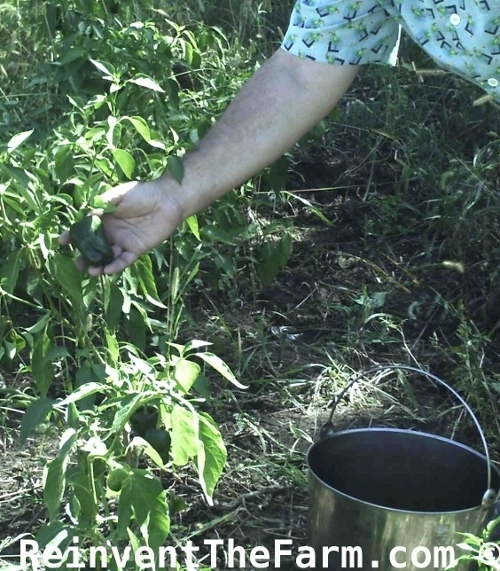 The tomatoes and peppers are throughly washed by agitating in clean water with several rinses, and hand wiped dry. (This is from my own garden which has no chemicals and inputs and handling are closely controlled.) Nothing has been cooked or blanched. The last ingredient is the tomato puree (with garlic) poured in hot (to prewarm the glass) and slowly (to allow air bubbles to rise). I normally pour to 1/2" head space going round to each jar, then around again until the bubbles stop rising. Place tips and rings on the jars and put in the pressure cooker (rigged for canning with spacer in bottom). Pour water in around jars until one inch from jar top. Seal the cooker lid, and crank heat up high until pan reaches 5 psi pressure. Immediately stop heat, and pressure down. Remove the cans to the air as soon as you can open the pot. If you are nearby you can hear the lids 'Pop!' as they seal and after jars have cooled, move to permanent storage in cool, dark place. On a date, it may not work for everyone, but I'm pretty sure that I had been eating onions when I got my first kiss. (Another important note, back at prep stage: Wait 3 days after processing hot peppers before holding hands.) This is good food anytime. Serve in small bowls with chips for party dip. There may be enough salt on the chips, but letting guest know where the salt shaker is may be good idea with this recipe. Top off the tacos, or serve on the side with enchiladas. A good side dish for any meal. Cook rice and stir in salsa before serving. For quick Chili con carne, fry some ground meat, and dump in some salsa. For excellent Chicken Quesadillas - Cut boneless, skinless chicken breast to one inch chunks. Brown in frying pan coated with olive oil. Then dump in salsa and salt to taste. Use medium heat till chicken is done. In separate frying pan place pad of butter then spin on a flour tortilla. Apply grated cheddar or jack cheese to half of the tortilla. Pour on chicken/salsa mixture on same side atop the cheese. fold over the tortilla and use mid-high heat till cheese melts, then add another small butter pad and flip to heat other side. Serve with beans and Rice with salsa on the side. Add spice to any meal, and make excellent dishes. Remember the salt, it ain't store bought.